A quick update to my long-delayed word-of-the-week series. Lovers of designer dogs should know that I won’t be writing about the kind of animal that usually comes to mind when one hears the word puggle. No, the subject of this post is a little harder to love. See? That little scrunched up whatchamacallit ball is a baby echidna — cute in its own way but probably less-than-appealing to the trophy pooch crowd. 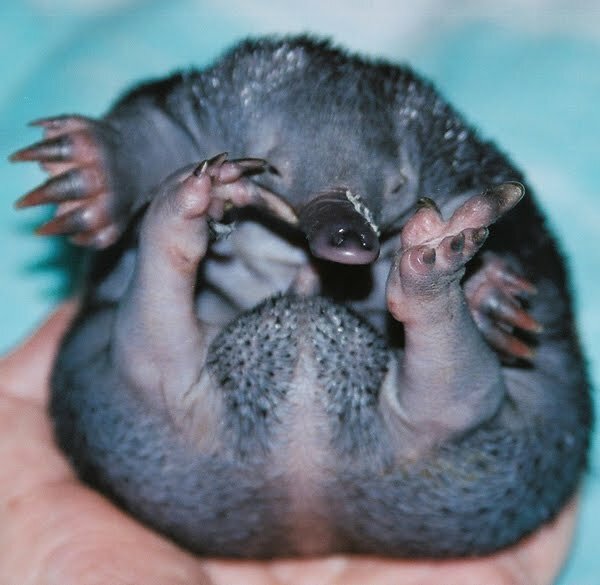 And this baby echidna and his fellow echidnitas would probably be pretty pissed to know that that there’s another species trotting around and being called puggles. puggle (PUH-guhl) — 1. a baby monotreme. 2. a mixed breed of dog created by mating a pug and a beagle. Incidentally, I checked Wiktionary’s list of baby animal names to see if some unfortunate species’ young was coincidentally called pekapoos or goldendoodles. Thankfully no. However, I did learn a few new ones: cria (a baby llama, vicuna or alpaca), leveret (a baby hare), and parr (a baby salmon).